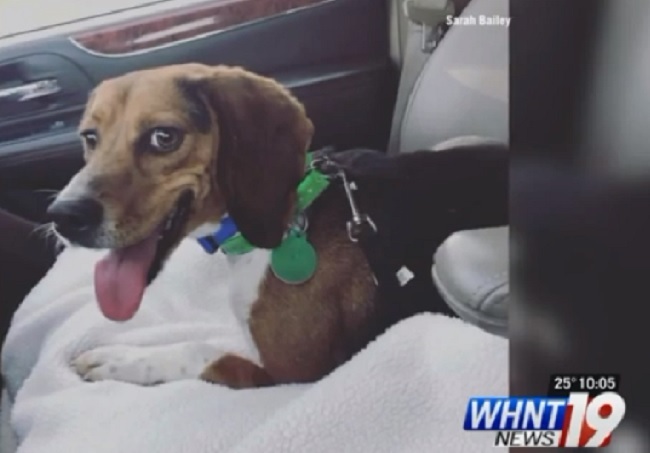 Usually when Sarah Bailey of Madison, Ala., took her Beagle, Olly, out to go potty at night, Olly would wait on the porch while Bailey grabbed her coat. But Wednesday night, Olly walked off — and fell through the ice covering a pond in the apartment complex where they live. Olly was an abused rescue dog who’d required lots of training to overcome his fear of people. Bailey wasn’t about to let him die. She tried to grab his leash and pull him out of the freezing-cold water, but fell through the ice as well. When Bailey’s 10-year-old daughter heard her cries to get help, she tried to help them herself — and also ended up in the water. She was able to climb out to safety. Neighbors and Madison Fire & Rescue quickly showed up to save Bailey and Olly. Meanwhile, during what felt like an eternity to Bailey, Olly was saving her from drowning. “He put himself under the ice that was breaking underneath me and it kept it floating,” she told WHNT. Tragically, her hero dog did not survive. “I was the only person he truly trusted because of the way he was abused and I feel like he was just saying thank you,” Bailey told WHNT. After rescuing Bailey, Madison Fire & Rescue warned pet owners to keep their dogs away from ice-covered water. If your dog falls through the ice, don’t try to rescue your pet, they advised; it can take less than 15 minutes for exhaustion and unconsciousness to occur. Instead, you should call 911 and wait for help.